Figure 1. 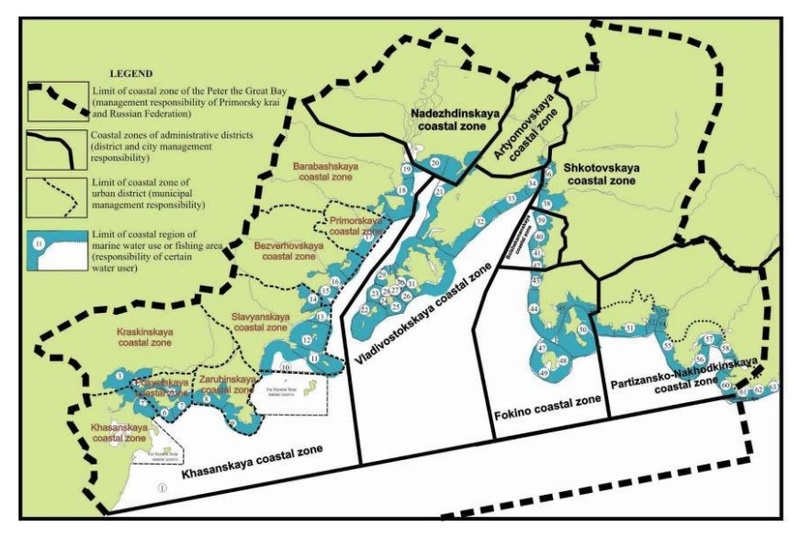 Boundary delimitation (functional zoning) of the Peter the Great Bay coastal zone (NOWPAP POMRAC 2010). Effective spatial planning in coastal areas requires the capabilities of several key ICTs. Spatial analysis and zoning are generally conducted using Geographic Information System (GIS) platforms. Remote sensing data (e.g. satellite imagery) is often used to supplement existing data during the planning process, as well as monitor changes over time. Finally, information management tools (data portals, databases, data analysis tools) and decision-support systems provide critical input for the integrated management of marine, river basin, and coastal areas. Coastal areas are typically characterized by the convergence of high-value ecosystems and concentrated human impacts. On one hand, some of the most important aquatic ecosystems (e.g. deltas, estuaries, lagoons) are located here. On the other hand, coastal zones host many of the most urbanized areas, together with intense economic and industrial activity. Coastal zone pressures cannot be effectively assessed within a geographic coverage limited to coastal zones: both upstream activities at river basin level and marine activities impact environmental conditions in the coastal area. The latter are also naturally shaped by the material and energy transfers between coastal and surrounding ecosystems (e.g. sediment transport, water quality, storm surges, river discharge, floods). Therefore, critical objectives of the environmental planning process (mineral, energy and living resources, waste disposal and pollution prevention, infrastructure development, tourism and recreation, etc.) for the wider coastal area can only be assessed within a wider, integrated framework. Integrated approaches to managing resources, pressures and impacts, have received considerable attention at river basin (Integrated River Basin Management / IRBM) and coastal area (Integrated Coastal Zone Management / ICZM) levels, within the overall framework of Integrated Water Resources Management (IWRM). Recognizing the need to further expand and harmonize land and marine management strategies, functional linkages between coastal, marine and river basin areas are targeted by additional instruments under Integrated Coastal Area and River Basin Management (ICARM) and Integrated Marine and Coastal Area Management (IMCAM). In order to understand the overlap but also differences between these approaches, it is useful to recognize them as environmental planning frameworks focusing on the interface between natural and human ecosystems, varying in the spatial and temporal scale of patterns of interest. Risk analysis: DSS, GIS, data analysis, simulation and optimization. The continuous development of ICTs presents managers and environmental planning practitioners with an ever-increasing array of tools to expand and integrate management approaches in coastal, land and marine areas. Perhaps the most important is the availability of spatial planning platforms (typically GIS based solutions often with built-in simulation/optimization capabilities and linked to a DSS) which allow identification, assessment, modelling and monitoring of functional zones that best capture the complex interaction between coastal and neighboring ecosystems. Figure 1 illustrates such an effort which links the management zones for river basins and coastal zones. Efforts to link marine area management to coastal zone management are also rapidly intensifying, as a necessary approach to tackle environmental pressures, impacts, and resource management issues that require a large-scale, integrated framework. 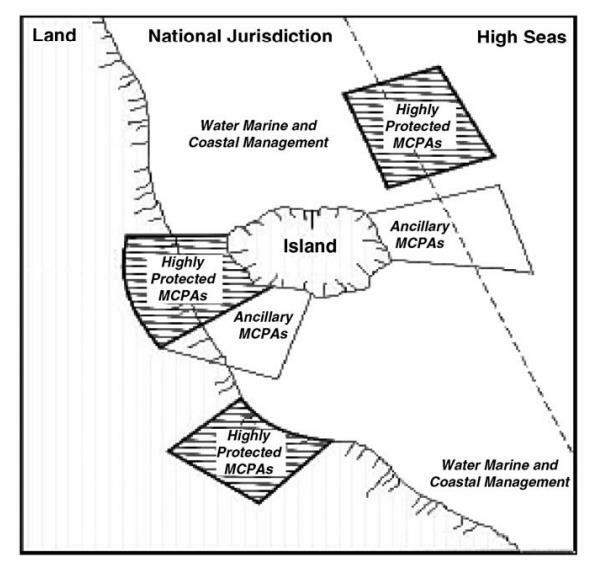 A good example is given by the inclusion of coastal and inland area management aspects into the assessment and monitoring of Marine Protected Areas (MPAs), which are often located near-shore, on the continental shelf (Figure 2). The specific requirements for data, ICT capabilities and expertise, required for integrated marine, river basin and coastal zone management are heavily influenced by local conditions and issues. 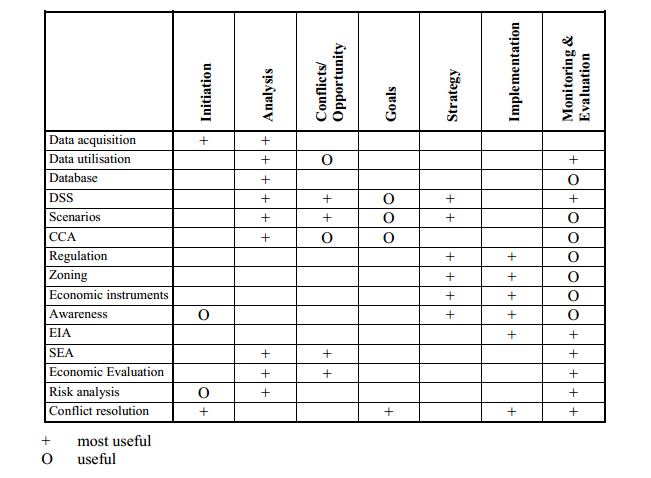 As a common objective, we can emphasize the importance of linking together data, tools and methods covering specific processes and areas (e.g. watershed management vs. coastal zone management) within an integrated framework. Knowledge management and knowledge sharing experiences are therefore some of the most valuable insights when discussing transferability of local approaches. ICTs provide a critical capability for improving the planning and management approaches of (wider) coastal zones. They allow practitioners, managers and decision-makers, to expand and optimize the information management process and link coastal, marine, and river basin management principles and tools. This, in turn, ensures that environmental planning efforts are effective in tackling current environmental challenges and adaptive/flexible enough for those of the future. NOWPAP POMRAC, 2010. Regional overview on integrated coastal and river basin management (ICARM) in the NOWPAP Region. POMRAC Technical Report No 5. UNEP/CBD/SBSTTA, Eight Meeting, Montreal, 10–14 March 2003—Marine and coastal biodiversity: review,further elaboration and refinement of the programme of work. UNEP/CBD/SBSTTA/8/9/Add.1. Montreal:CBD; 2003.